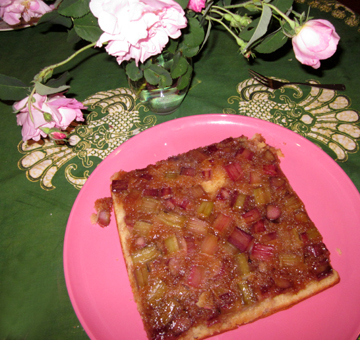 I know, I know, I just posted a recipe for rhubarb upside-down cake! After various peregrinations I am finally home in Hawley, Massachusetts, contemplating the gorgeous greenery everywhere and the abundant rhubarb in my yard. Seeing its lush (if poisonous) green leaves and strong red stalks has inspired me to try yet another upside-down cake. You may recall that the previous recipe from Sue Haas featured marshmallows. This ingredient surprised some of the commenters, particularly the eloquent Flaneur. Here I dispense with the marshmallows and combine Sue’s recipe with my own for pineapple upside-down cake. Sue’s Michigan upside-down cake is not too sweet and not too goopy; the marshmallows hold it together and give it a slight vanilla flavor. This version is definitely sweeter and richer. On the other hand, it’s also a little more rhubarby. The marshmallows tend to tame the rhubarb in the other recipe. Melt the butter in a saucepan. Stir in the brown sugar and cook, stirring, until it melts and bubbles—3 to 4 minutes. For the cake cream together the butter and sugar. Beat in the eggs, 1 at a time. Add the baking powder and salt. Stir in the flour alternately with the milk, beginning and ending with the flour. Stir in the vanilla, and pour the batter over the rhubarb mixture. Bake the cake until a toothpick inserted into the center (but not too far down; don’t hit the rhubarb!) comes out clean, about 40 minutes. If the cake is brown but not done before this happens, decrease the oven temperature and continue baking. Serve alone or with whipped cream. Serves 9. I should think you could absolutely bake this pan in a 10-inch iron skillet (heating the butter and brown sugar in it first, and then piling on the other ingredients). I couldn’t find my skillet, however, so I used a square pan and can only report on those results. This entry was posted on Friday, June 11th, 2010 at 4:00 am	and is filed under Cakes, Pies, and Pastry, Rhubarb. You can follow any responses to this entry through the RSS 2.0 feed. You can leave a response, or trackback from your own site. To fellow readers of this blog: I had the good fortune to perfectly time my visit to Hawley yesterday. Stopping by to visit Tinky and Jan (and Truffle and Lorelei) I was rewarded with an enormous portion of the rhubarb upside-down cake (“Rhub-upsy-daisy cake?”) as I departed. After an appallingly long drive back to Connecticut (wretched thunderstorms and heavy traffic) I rewarded myself at home with the cake. It was superb. 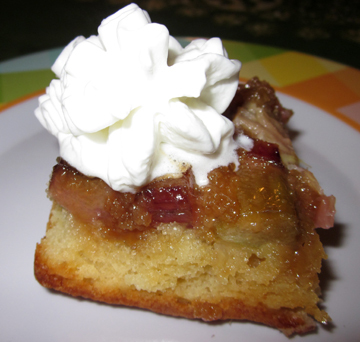 It had the glorious caramelized sweetness of the brown sugar, the not-overwhelming tartness of the rhubarb, and the lightness all too seldom found in many similar cakes. This morning with coffee, I tackled the remaining cake. It had been in the refrigerator so I zapped it in the microwave for a few seconds (22 seconds, to be precise) and enjoyed fabulous warm rhubarb “coffee cake”. Were I to make this as a dessert (it would be tempting to make this regular breakfast fare), I’d eschew whipped cream in favor of a dollop of crème fraîche. I enjoy the zing and zest of the pineapple’s flavor, but think this is a subtler, more refined and ultimately more earth-friendly recipe for New Englanders – the rhubarb is right at one’s doorstep and requires no shipping from Hawaii. Now where’s the rhubarb blintz? I grew up on rhubarb….rhubarb crisp, rhubarb sauce (canned and eaten throughout the year), lots and lots of rhubarb pie (for which I’m going to post the recipe on my own blog one day soon). It’s fresh, tart, earthy goodness brings back many fond memories for me. I will definitely be trying this recipe down the road – thank you for sharing. Welcome back Tinky, and thanks for this reminder of how much I love upside-down cake, mainly because when it’s done, it’s done. No frosting to think about, okay maybe whipped cream. When my kids were small, they thought I was pretty amazing for being able to make a cake that came out of the pan with pineapple and cherries on top. Ah, unfortunately they became adults and learned that it wasn’t magic at all. I am going to make this one because I actually have all of the ingredients in my minimalist living arrangement. Your cake looks delicious, Tinky. Last Sunday (6/6/10) the Seattle Times’ “Pacific Northwest” magazine had an article, “Raves for Rhubarb,” about a rhubarb farm south of Seattle (where I live) that included a recipe for Rhubarb Fool. I haven’t tried it yet, but what could be easier than a little cooked rhubarb, fresh orange juice, and sweetened whipped cream layered in parfait glasses? I found another article in the Seattle Times with a rhubarb recipe served to the President of China and Bill Gates recently at a shindig in Kirkland, near Seattle. Rhubarb Brown Butter Almond Cake. The recipe link is at the top of the article. Can’t wait to try this one–along with your cake recipe, too, of course! I only have one word to say ….. yummy!! Sheila, I’m sure the cake will be even better with your farm-fresh eggs. Sue, I have a rhubarb fool recipe in my cookbook that uses lemon peel instead of the orange juice, but I like the sound of the orange. 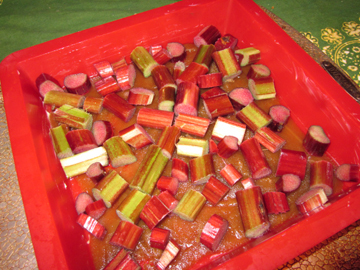 And what could be more perfect to serve to President Hu (he’s always on first) than rhubarb, which came from China? Frayed, I like your word.